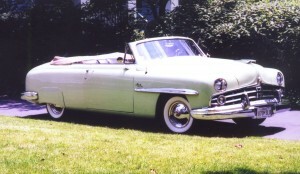 In 1953 Tony Fotos purchased a used 1949 Lincoln Cosmopolitan convertible for $400. Although the 152 horsepower V-8 engine returned fuel economy of only 8 miles per gallon, gasoline was selling for 28 cents a gallon. After a few years the Lincoln was sold, the young couple married, and life went on. While attending a high school reunion in Maryland in 2005, many of the couple’s former classmates asked them about the old Lincoln. Those inquiries were the catalyst that sent Fotos on a quest to find a car like the Lincoln. He discovered that not many Lincoln Cosmopolitan convertibles were manufactured and very few survived. When new in 1949, the 4,419-pound car had a base price of $3,948. “I looked all over,” Fotos recalls. He finally found one for sale in North Carolina. The owner was in Florida and the broker handling the deal was in California. Regardless of the car’s condition, Fotos was confident that he could handle any restoration work. “I bought it sight unseen,” he says. The seller wanted the car to be in perfect condition when he sold it, so he had the Lincoln trucked to a shop in Pennsylvania for some minor work. When Fotos was informed that the work was completed he was told other work also needed to be done: a new brake system, new shock absorbers, new tires and a new top with a tiny glass rear window. He says he had to stall because he needed more time to complete the garage he was building to house the Lincoln. Finally the Chantilly Green convertible with the tan top arrived on the back of a truck. “I was astounded when I saw it,” Fotos recalls. The headlights and the taillights are recessed into the fenders and the front wheel wells are crowned with eye appealing gravel deflectors in chrome. Under the expansive engine hood is a 336.7-cubic-inch V-8 that Fotos says was originally designed as a Ford truck engine. As befits a luxury car, the interior is primarily covered in either green leather or tan carpet. Fotos did add one item that was not on the Lincoln accessory list. He says he had a suicide knob on his Lincoln in high school, and so too, he now has one on this Lincoln. He explains that one-handed steering is possible when his right arm is around his best girl. In that post World War II era, Ford Motor Co. was developing an automatic transmission for the big Lincoln but it wasn’t ready for production. Consequently, the Ford-produced Lincoln has a General Motors-produced Hydra-Matic transmission with a shift pattern from the left of Neutral-Drive-Low-Reverse. There was no parking gear. Fotos has noticed that at a certain speed his transmission slips a little, but he is unconcerned because he remembers his first Lincoln exhibited the same slippage, which never caused any problems. The 1949-model-year Lincoln was a luxuriously appointed automobile with power windows, one-piece windshield, heater, turn signals and a radio. The radio has a signal-seeking function. On the back of each front seat cushion is a built-in ashtray for the convenience of smoking passengers in the back seat. This entry was posted in Classic Cars of 1940s, Let's Restore this Old Car -- Classic Classics. Bookmark the permalink.